Pierogies from the Red Chimney. I love pierogies. If I could eat them every day of my life, I would be ok with it. I might not live long, but I would die happy. My favorite kind are the classic potato/cheese. I love them simply in butter and a little crispity. 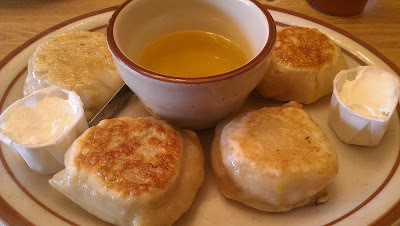 Some people like onions or sour cream with their pierogies, but I promise, just butter is delicious. Homemade ones are best, especially if they are made by Polish church ladies. St. John Cantius in Tremont has tasty ones during the Polish Festival. The Red Chimney - This Slavic Village staple serves everyone from local politicos and the crime scene detective to neighborhood folks and gangster types. The food is delicious and if you don't get the pierogies, you are ordering wrong. The pierogies are the kind that are stuffed so full that sometimes they crack a little and the tastiness oozes out. My folks love the city chicken and stuffed cabbage too. Prosperity Social Club - I have no idea why it has taken me so long to find this joint in Tremont. They have loaded potato pierogies that are pan fried, baked and topped with cheddar cheese, bacon, onions (I leave those off - yuck) and bacon aioli. Prosperity's pierogies are made by a little lady in the neighborhood that only makes them for Prosperity. Great Lakes Brewing Company has a yummy pierogi and bratwurst combo that is accompanied by red cabbage and they have Christmas Ale, so there you have it. My favorite in Ohio City. And, no, Mrs. T's is not good in a pinch. Those pierogies are dough pockets. Blech. 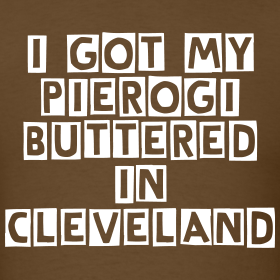 Where is your favorite pierogi place? Sokolowski's and Babushka's Kitchen have awesome pierogi.